Hindu Samhati, diminutive yet prominent pro-Hindu advocacy group in Bengal, initiated its journey in Kolkata with just 300 members on February 14, 2008. And from that year it has been celebrating the day with splendor; the burgeoning Hindu activists and endorsement happens to be its mainstay. To intensify the same and also to depict the truth of Hindu persecution and sinister designs against Hindu movement, observance of the anniversary happens to be an obligation for Hindu Samhati. Every February 21, a little-known observance occurs: International Mother Language Day. Created in 2000 to promote and encourage the diversity of language, this benign and idealistic-sounding commemoration actually marks a bloody day in 1952 when an Islamic minority shot and killed university students protesting the imposition of an Islamic language, Urdu, on a Bengali-speaking majority in Pakistan. 4 th Anniversary of Hindu Samhati on February 14, 2012 is indeed a history owing to several factors occurring at the same instant. While on one hand it happens to the be the defiance and steadfastness of Hindu Samhati, the role of distinguished speakers and dignitaries gracing the occasion that did galvanize the vast Hindu crowd deserves special mention. Vrindavan alias Brannon Parker, well-known author and journalist hailing from United States, through his soul-stirring speech did also motivate the Hindus to a large extent. The speech was the greatest exposition of truth and also self-reliant and valorous. Malancha, situated in Sub-division: Basirhat, District: 24 Paraganas (North), has been a hotspot of animosity between Hindus and Muslims for years and village: Sastitala, one of the many villages in it, witnessed a corresponding flare-up once more on February 19, 2012. However, the basis of this hostility is quite unusual and it’s regarding a transformer (an electrical device by which alternating current of one voltage is changed to another voltage). Each of the Hindu and Muslim localities in the village enjoys a separate transformer; Islamist bid to exploit the Hindu locality’s transformer initiate the bloody crisis. 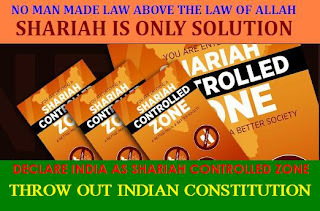 What can be the true effect of a strong, defiant and unified movement is best ascertained from the struggle against the Islamist website www.shariah4hind.com; the vigorous campaign headed by Bhagat Singh Kranti Sena has won the first round of the battle with the Hon’ble Delhi High Court looking for a status report from the Commissioner of Delhi Police on the Public Interest Litigation (PIL) filed by the Sena for demanding prohibition on the aforementioned Islamist website having enough potentials to disrupt the national integrity, communal harmony across India. The Bench comprising Acting Chief Justice A.K. Sikri and Justice Rajiv Shah Endlaw instructed Police commissioner to submit the imperative report within a week. Hindu Samhati, to reveal increasing State Repression on Hindu Samhati, Hindu genesis in Bengal in public, organized a Press Conference here in Kolkata today at the Kolkata Press Club. The conference was conducted by Sri Animitra Chakraborty (Media-in-Charge, Hindu Samhati) while the dignitaries adorning the occasion included Sri Tapan Ghosh, president, Hindu Samhati, Swami Tejsanandaji, Sri Abhoy Vartak (Sanatan Samstha), Michael Brannon Parker (well-known author from United States). Hindu Samhati, one of the most prominent pro-Hindu rights advocacy group in Bengal and India, from its formal beginning in 2008, has been striving to establish Hindu interest and righteous Hindu causes. In all these years, Hindu Samhati has gone through several obstacles and has also confronted an assortment of risks to give a new face to its ideal – venerable existence of Hindus in Bengal, at stake owing to fast rising minorityism under the aegis of governance and a few evil political intentions. Hindu Samhati, at the same time, exhibits its complete faith on the legal framework and Constitution of India. Nevertheless, there has never been any end to portray Hindu Samhati as radical by different echelons of political arena and governance. Sri Tapan Ghosh, president, Hindu Samhati, is bailed out finally, after days of wait and apprehensions, dashing hopes of anti-Hindu forces to detain him further and scuttle the rising Hindu strength in Bengal such. This significant event took place today, February 18, 2012, in the First Court of Additional Chief Judicial Magistrate, Alipur, around 4 pm. Sri Ghosh was arrested on February 14, 2012, at 9:30 pm from his residence by police of P.S. Jadavpur with an arrest warrant issued against Case No. 52/dt 05.02.2012 u/s 295 A, 298 and 120 B (IPC). And it can be said indubitably that the entire development had been a part of the conspiracy hatched by the existing governance to stamp the 4 th anniversary of Hindu Samhati at Raja Subodh Mallik Square (Wellington Square) down. Hindu Samhati, witnessing an assortment of inhibitions and also malicious approaches of the government to scuttle any impeccant and upright and audacious Hindu voice like it in Bengal, has attained a historic success today with the grand celebration of its 4th Anniversary at Raja Subodh Mallik Square (Wellington Square) in Kolkata, beholding in the past few days the hell-bent onslaughts of the administration to call it a halt. Defying vindictiveness of the governance (influenced by Islamists and its own obeisance to the anti-Hindus to maintain a minority vote bank with conviction) 30, 000 Hindus were present on the occasion and all these helped it to assert proudly once again that Hindu Samhati remain undeterred to any venomous design, resolute to stop its marching towards forming a novel basis of Hindus in the state. However, tens of thousands supporters of Hindu Samhati were prevented by police from attending the assemblage. 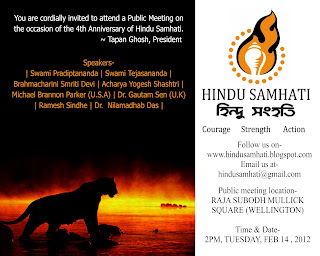 Hindu Samhati Resolves Not to be Cowed Down ; 14th Feb Program shall Happen !!! 'Undemocratic orders and Muslim Appeasement policy of TMC government shall not deter us' - Tapan Ghosh. . Rising influence of Hindu Samhati and mounting struggles of Hindus under its leadership across the state of West Bengal have been perturbing the state government hell-bent to appease Islamists round the clock and its strong ill feeling became obvious (first) through the cruel and indifferent attitudes of administration towards Hindus, tortured by Islamists while urging people to join the imminent 4 th anniversary of Hindu Samhati on February 14 in strength. 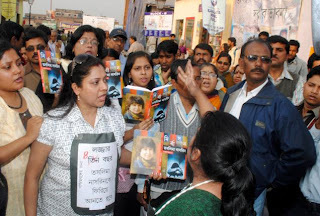 Lots of its activists have been detained to teach Hindu Samhati a lesson. Even the personal residence of Sri Tapan Ghosh, president, Hindu Samhati, was not spared; it was raided by a large contingent of police personnel and a case, on flimsy ground, was slapped on him. . Please Click Picture to view Full Poster. Please Click to view Full Poster. Pernicious strategies to inhibit Hindu Samhati took place lots in the past and now, with each day more Hindu Samhati is advancing to make the upcoming 4 th anniversary of it a historic success, more roguish gambits are being devised to bog it down outright. And the undeserved detention of Sri Ranjit Kar, age 82, veteran activist and longtime well-wisher of Hindu Samhati, today itself, to campaign for the aforementioned impending 4 th anniversary on February 14, happens to be the latest ploy in this regard. A single happening often becomes an indication of a sinister development in next to no time – history has taught in different fashions that such a notion is not divinatory or hypothetical but speaks of a crude reality altogether. 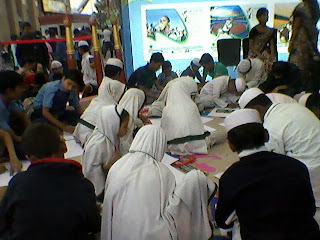 What has taken place in Kolkata Book Fair, 2012 is not only disgraceful but speaks of an ominous future for the whole of Bengal in the coming days. Will it lead to a novel experimentation for another Pakistan? There is simply no end to efforts of reigning Trinamool Congress-led Bengal government to exert its empathy towards minority Muslims in the state and the latest approach on its part, in this regard, happens to be the decision to make Urdu the second official language in the state. Well, there is something more to add – it will be made in areas where Muslims form sizeable populations or make 10 per cent of the total populace. Political analysts have already started to term that this overture will give the party an edge in the coming Panchayat election. It is worthwhile to mention that this issue was mooted by the Information and Cultural Affairs Department of the State Government. However, the role of Minority Affairs Department under the aegis of Chief Minister, Mamata Banerjee, in this context, is momentous. Secularism, by its definition, does signify a philosophy or a doctrine that rejects religion and religious considerations of every form. This is the most ideal stance known hitherto but what India, under the aegis of alleged secularists, has been practicing (from the beginning) happens to be ruthless altogether. Whereas any onslaught on Hindu belief is exalted as a right to freedom and the offender never finds him/herself alone thanks to champions of Human Rights and a considerate administration, the reverse takes place when on earth consecrated Islamic beliefs are tormented. Cases of Maqbool Fida Husain and Salman Rushdie depict the same. No physical appearance is needed any more; just the phone of any Islamic fanatic or fanatical organization is enough to stall the voyage of truth (unflinching criticism of Islamic notions and its consecrated viewpoints) in Kolkata. There is a well-known saying that braveness and not numbers win the war; this is proved once again with the success of Hindus living in Basirhat, Bengal through foiling a nefarious Islamic design to occupy legitimate Hindu lands steadily. Hindus, in reality, do hail from Chotojirakpur Swasti Colony, Mukherjee Colony, Hazratala Colony and Mathpara Colony, P.S. Basirhat, District: 24 Paraganas (North). Only a few Muslims in the area were endeavoring to create a mosque in the area and thus to evict Hindus. This had been going on for years; Hindu valiance did put an end to it in the end. The recent coup d'état though failed ultimately in Bangladesh has made many to mull over the radical developments in the Indian subcontinent (of late) and its effects on the democratic structure of India. Without doubt, any such efforts of putsch is neither healthy nor brings forth any halcyon future for Bangladesh but does signify a chaos resulting into a ruination on the whole. Sankrail, Howrah is becoming a hotbed of Hindu Muslim animosities and undoubtedly, fast rising Islamic fundamentalism happens to be the main cause in this regard. On January 31, the residence of Felu Sardar (age 45), inhabitant of Snakrail Battala, P.S. Sankrail, District: Howrah, was bombed by a few masked Muslim youths leading to destructions of the abode and injuries of Hindu family members residing in it. Even if almost all of them escaped in secret, Sabir Ali Sheikh, noted Muslim thug of the area, was identified by a few neighbors of Felu. History is recurring; in the momentous days of 1940s celebration of Saraswati Puja turned out to be the greatest bone of contention between Hindus and Muslims. While Muslims, on no account, were ready to accept the same ever, Hindus were determined to do the same in any way – leading to riots in various parts of then undivided Bengal. The same is taking place once more and village: Ramchandrapur Kaity para, P.S. - Bagnan. District: Howrah does bear testimony of the same. On January 29, at 9 pm, when a function regarding Saraswati Puja was in full might in the village, Muslim youths misbehaved with Hindu girls leading to serious clashes between the two communities.